Today is World Mental Health Day and so I thought it an appropriate day to share some of the research myself and colleagues have been working on earlier this year. This article is longer than I normally write but it’s worth the time to read it through as it contains some thought provoking results and insights, with significant implications for any one working in behavioural change, stress or well-being, or mental health. Changing Minds™ is a unique behavioural change programme that uses a model of Thought as a System that explains how the same system of thought creates the behaviour of a terrorist, just as it creates the behaviour of a peace keeper: same system, but very different behavioural outcomes. This is a game changer, not just in extremist behaviour, but in other areas, such as gangs, drug/alcohol abuse or even weight loss and child behaviour/performance etc. A key principle of Changing Minds™ is a scientific understanding of how a person’s reality is created explaining the simple process of how Thought is created and how we all come up with unique Thoughts, and acting on these – or not acting on these – creates all behaviour. And whilst what seems important is the content of our thinking, of more practical use is an understanding of the system of Thought. This is the foundation of Changing Minds™. Another key principle is that Thoughts change quite naturally and therefore so can behaviour – as people open their minds to the system of Thought: that what may look and feel real is more of a mind-made illusion. A key distinction is between a Concept and an Understanding. When we see something conceptually, there is no change in our Thoughts and actions, i.e. our behaviour. And the behaviour hasn’t changed because the Thinking behind it hasn’t changed. But when we understand something it has an impact in our daily lives and our Thoughts and actions change automatically. That difference is through having an insight i.e. an entirely new Thought. For example, we conceptually know that eating an excessive amount of food means we will put on weight – we all get bombarded with messages every day about this and yet nothing changes for many of us who have struggled or still do with weight gain. But when an insight or realisation occurs we discover what works for us as individuals. And that insight occurs in a nano-second. And the resulting change of behaviour can be dramatic and life-changing, and instant! Changing Minds™ is a process that generates the correct framework to create the conditions where insights – and thus thoughts and behavioural change – are far more likely to happen. And once that occurs the new behaviour works better for the individual and participants become more resilient and considerably less likely to be influenced by others’ mis-guided thoughts and behaviour(s). And the changes then show up in the daily lives of the participants as they live with their new thoughts, and resultant behaviour(s). It is widely assumed that Well-being comes from background, circumstance or other people and the traditional way to improve well-being is to cope or manage these. Most Mental Health interventions work on this assumption. But as there isn’t any causal evidence for this we decided to test this assumption. You don’t need to take my word for this as the UK Government sponsored research “5 Ways to Well-Being” came to the same conclusion. 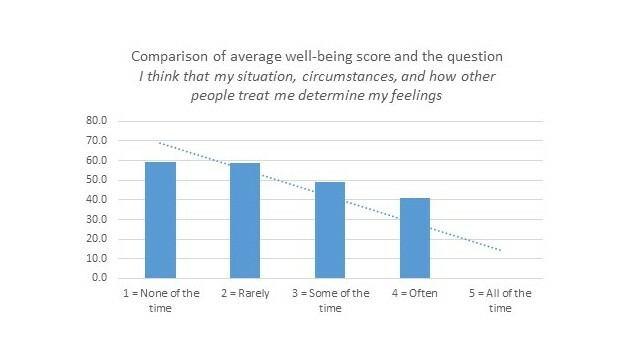 So we did some research to test this assumption using the standard Warwick Edinburgh Well-Being Survey which asks 14 questions on how they are feeling, and then we asked a 15th Question to ask the level to which they thought background, circumstance and other people influenced/determined their feelings. The answers might confound your current thinking! We took a group of 25 Young People (aged 16-25) who were identified as at risk of extremist behaviour. That is, without some intervention there was a strong possibility they would be influenced by others’ agendas in to extremist behaviour. These people are often called ‘hard to reach’ or ‘hard to change’ as traditional interventions haven’t worked for them. Also, if Changing Minds™ works with ‘hard to change’ people, then surely it would work with other ‘hard to change’ people such as weight management, drug/alcohol, stress, weight loss, you name it. The young people were referred to us by various organisations as they deemed them “at risk”. They went through a 4 day coaching based intensive workshop, follow up coaching, and weekend residential. Essentially, we don’t tell people what to do or how to behave. Rather, we create the conditions where behaviour is more likely to naturally occur. Participants were monitored through various measures on Well-Being, Resilience and how they are managing various Aspects of Life, before, during and after. My friends/social networks – improved by 22% overall, with a high of 67%. Being better connected to friends and families is considered a protective factor preventing extreme behaviour. But, it’s not about having friends and family around you, it’s actually having the high presence of mind to recognise them and use them for support. I’ve been feeling relaxed – improved by 30% meaning participants were now feeling less stressed. Whilst these are all outstanding results in themselves (traditional interventions in drugs/alcohol, re-offending reduction, weight loss, child behaviour/school performance, CBT and stress/anxiety usually work for around 5% – 15% of people), the most interesting one is around the assumption of where feelings and thinking come from. If you remember, it’s assumed that thinking and feelings come from – or are determined by – background, circumstance and other people. For example, the social media makes people feel happy/sad/insecure etc. And I’ll remind you again, there is actually no causal evidence for this assumption. The more participants realised that feeling and thinking is not determined by circumstance, background and other people, so they experience increases in their well-being. A difference of 45% from one end of the scale to the other. For comparison, a study in to the effectiveness of a 12 week programme of Mindfulness to improve well-being amongst school pupils (http://bjp.rcpsych.org/content/203/2/126) yielded a 3% improvement. Changing Minds™ improved Well-being by 16%. 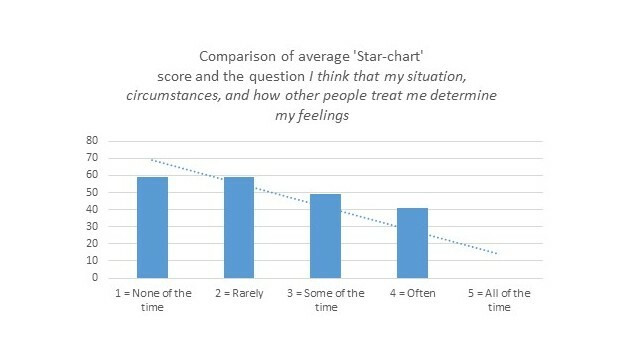 Again, the more people understand that their feelings are independent – and not assumed to be ‘caused’ by – so does their ability to manage their lives. The difference from one end of the graph to the other is a 49% increase. 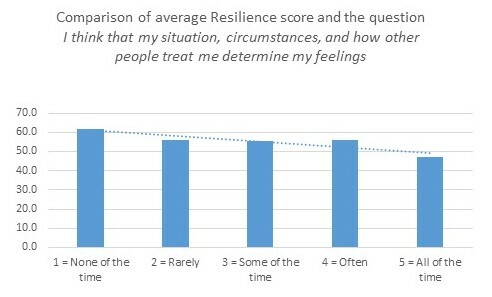 And again, the same result occurs: the difference from one end of the spectrum is a 31% increase in resilience scores. It seems then that by pointing people towards that they are source of their own feelings and thinking – which is independent of circumstance, background and other people – enables them to experience higher levels of well-being, better manage their lives, and be more resilient. And the same is true – just like gravity – whether you believe in it or not, everyone is experiencing the same Thought as System. The results bear out other research we have done in stress and well-being: the more people understand that their thoughts and feelings are independent of background, circumstance and other people, the significantly higher their levels of well-being and lower levels of stress. Over, better mental health and more resilience. And if you’re interested in the Science Behind, here’s the causal explanation: http://headstuff.eu/the-science-behind/ based on the sciences of Physics, Biology and Neuroscience. The difference in behaviour change is this: it’s how you show up, not what shows up determines behaviour. And understanding this puts you firmly back in driving mode, instead of victim mode. As one participant put it: Even though my circumstances haven’t changed – he was still living in and hostel and out of work – I now feel good, really good. The results we have got are similar to previous (non-intervention) surveys we have done with sample sizes of up to 60 people. We’d like to gain ore data and you can help with this (see below). The implications of this could be significant, as the System of Thought is universal. It is content and context free which means Changing Minds ™ is could be suitable for virtually all behavioural change interventions, or social interventions such as mental health, weight loss, PTSD, Child Behaviour, Learning, stress etc. And even in business too in problem solving where analytical approaches have failed and projects failed to deliver. In my experience working in projects the outcomes have been achieved with the least amount of time and energy and the teams I’ve worked with become more resilient and resourceful. As one client said once: I don’t know what you do with your project teams but they calmly get on with the job whilst the rest of the staff and organisation is in melt down. Here, they are describing an insight, but you’ll miss the point of change in a blink of an eye, as it happens so quickly, and the ‘blame’ is put on new found confidence, motivation or willpower. Which are all consequences of a change of mind, not a pre-requisite. And with an insight, all the offers of help and support and programmes suddenly become useful and impactful for the person, so I’m not suggesting we throw the baby out with the bathwater. Just suggesting how behavioural change support programmes could achieve considerably better results (in my experience about 50-80% better results) with the least amount of time and energy (the Scientific Principle of Least Action) as a consequence of creating the conditions where a Change of Mind – the insight – is more likely to occur. This would be a game changer for anyone working with in doing more for less agenda, that is seeing a problem staying the same or getting despite what they are doing. Our research is preliminary, yet promising and this is where you can help. I’ve shared online two of the standard surveys we use, stress and well-being. If you would take about 90 seconds of your time to complete the 15 questions in one or both surveys that would help us build our research data. At the end of each survey you get a score on your stress and well-being. Thank you for helping. If you would share these links and/or this article that would be helpful too. We already have a Toolkit/Train the Trainer Manual that contains the details the approach, its application in wide variety of contexts, the understanding and science behind it, enabling Changing Minds™ to be rolled out in a sustainable way. You might be very surprised (or shocked) to hear what happened at the start of the weekend which could have had a significant impact on the participants experience but despite this they experienced profound changes. I work with university students in careers as a coach but have recently gained my own insights into the 3Ps. I’m really keen to learn more about your train the trainer offer. Very interesting article, by the way!